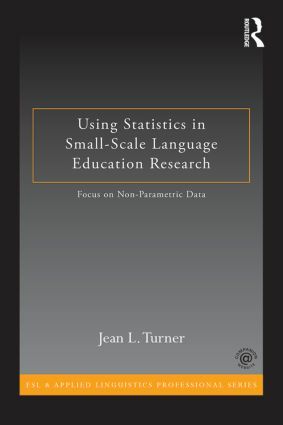 Assuming no familiarity with statistical methods, this text for language education research methods and statistics courses provides detailed guidance and instruction on principles of designing, conducting, interpreting, reading, and evaluating statistical research done in classroom settings or with a small number of participants. While three different types of statistics are addressed (descriptive, parametric, non-parametric) the emphasis is on non-parametric statistics because they are appropriate when the number of participants is small and the conditions for use of parametric statistics are not satisfied. The emphasis on non-parametric statistics is unique and complements the growing interest among second and foreign language educators in doing statistical research in classrooms. Designed to help students and other language education researchers to identify and use analyses that are appropriate for their studies, taking into account the number of participants and the shape of the data distribution, the text includes sample studies to illustrate the important points in each chapter and exercises to promote understanding of the concepts and the development of practical research skills. Mathematical operations are explained in detail, and step-by-step illustrations in the use of R (a very powerful, online, freeware program) to perform all calculations are provided. A Companion Website extends and enhances the text with PowerPoint presentations illustrating how to carry out calculations and use R; practice exercises with answer keys; data sets in Excel MS-DOS format; and quiz, midterm, and final problems with answer keys. How are Research Questions Formed and what are the Parts of Well-Written Research Reports? What is Logical about Statistical Logic and what Purposes does it Serve?